G. Mills has joined as an investor and advisor. in as few as three minutes. Dan O’Malley, founder and CEO of Numerated. being used to evaluate the credit worthiness of businesses. Business Banking Conference in Chicago on Tuesday, May 21, 2019.
leverage technology to attract and deepen relationships with businesses. business banking within their markets. 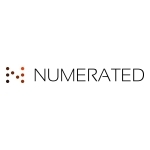 Learn more at www.numerated.com.